Ramraja or Rajaram II (1749-1777) was the putative grandson of Rajaram (the uncle of Shahu), and Tarabai. Tarabai presented Ramraja to Chatrapati Shahu as her grandson, explaining that she had kept him hidden to protect him against any assassination attempts by her rivals. Shahu had no heir of his own so he was happy to adopt a child from the Bhosale family of Nagpuras his successor. But, Tarabai reasoned with him, when a direct descendent was available, why should he adopt someone from outside his immediate family? By this reasoning Shahu adopted Ramraja and declared him his successor. Tarabai had hoped that Ramraja would be a puppet in her hands and she would be able to control the throne of Satara, but Ramraja proved unyielding. So Tarabai denounced him as an impostor and even imprisoned him by the use of deceit. During the reign of Ramraja, Maratha power was largely controlled by the Peshwas. Shahu II (1777-1808), or Aba Sahib, was the adopted son and successor of Ramraja. He was adopted by Ramraja just before his death in 1777. Shahu II was born Vithoji Bhosale, his biological father being Trimbakjiraje Bhosale of Wavi. He was only a titular king and, as with his predecessor, real power rested with the Peshwa. Shahu II died on 4 May 1808. Pratapsinha (1808-1839) was the eldest son and successor of Shahu II. Since he became king at a young age, his affairs were managed by his mother, Anandibai. Her relations with the Peshwa, Bajirao II, were initially cordial, barring letters of complaint about their inadequate allowance. However, shortly before the first Anglo-Maratha war, Peshwa Bajirao II kept Pratapsinha a virtual prisoner in Fort Wasota at Satara. The reason for this was that the Peshwa was losing support from his Maratha sardars, so he wanted to keep the king under his control. Also, the Peshwa had received reports of Pratapsinha's secret conspiracies with the British resident whom he hoped would be able to free him of the Peshwa's control. But by 1818, Pratapsinha had already started secret negotiations with the British governor of Bombay, Elphinstone, through his confidantes, Narsu Jamadar and Balwant Malhar Chitnis. 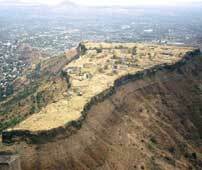 The British soon took over Satara and Pratapsinha was reinstated as the chatrapati (king) on 10 April 1818. As per a treaty between Pratapsinha and the East India Company in 1819, James Grant was made the resident of the British East India Company. He was able to train the king in the intricacies of administration, of which he had so far been kept deprived by the Peshwa. It was also decided that after the raja was sufficiently trained in administration, power would be passed gradually to him. 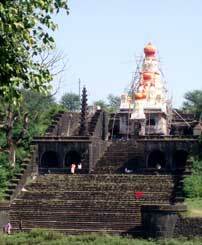 On 5 April 1822, the king was formally handed over his seal, and the fort of Pratapgad was ceded to him. James Grant also took leave of the king and left for England. After Grant there were many more British political agents: John Briggs in 1823, William Simpson in December 1826, A Robertson in June 1827, and Lodwick in 1832. Pratapsinha shared a cordial relationship with all these residents, all of whom who had only praise for this eager, congenial, well-meaning young king. But after 1832, differences between the British East India Company and the king started to emerge. The king was feeling deprived and slighted over his jurisdiction. Accusations began to be thrown back and forth between both parties, each charging the other with violations of the understanding between them. The king was accused of conducting hostilities against the company, charges which the king vehemently denied. Finally on 5 September 1839, the British East India Company dethroned Pratapsinha and installed his next of kin (Pratapsinha's brother, Shahaji, otherwise known as Appasaheb) onto the throne of Satara. The king was also banished from his kingdom and exiled to Benaras. He and his dependents were to lead their lives on a stipulated pension to take care of their sustenance. Pratapsinha died in Benaras on 14 October 1847. Shahaji / Sayaji, also known as Appasaheb (1839-1848) was the brother and successor to Pratapsinha. He had a reign of seven years under the British resident, Charles Ovans, until his death on 5 April 1848. Shahaji adopted a son, Venkoji (otherwise known as Bhauaheb or Venkatji) on his deathbed. However, Venkoji was immediately deposed as the British refused to acknowledge him as king because he was not Shahaji's natural son. Shahaji had no natural son, so the kingdom of Satara was annexed to the British dominions as per the short-lived Doctrine of Lapse. From that point onwards, the state of Kolhapur became the legitimate throne of the Marathas as recognised by the British. Venkatji (1848-1864) was the adopted son of Shahaji. Pratapsinha II / Rajaram (1865-1874) was Venkatji's adopted son. Rajaram III (1874-1904) - adopted son. Anna Sahib (1904-1919) was the natural son of Rajaram III. Bhav Sahib / Bhausaheb (1914-1925) was the natural son of Rajaram III and brother of Anna Sahib. Captain Shrimant Raja Shahu Pratapsinhji Bhonsle Chhatrapati Maharaj (1925-1950) was also known as Chandrasen Bhosale. He was the adopted son of Bhau Saheb. 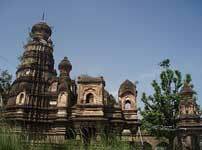 India became an independent republic in 1947 and all princely states were abolished, including the state of Satara.